I love archives. I love the smell of old paper and the thrill of going through old documents and stumbling on a treasure trove of information. I love to look at old photographs and what they tell us about the way people lived and how they thought. And it breaks my heart when I see these wonderful pieces of our history crumbling away through the ravages of pollution, time, and damaging storage environments. An archivist once told me that one day, as he worked among the stacks of an old film collection, he could literally hear the films flaking apart all around him. He said it sounded like it was raining. Argon is one of the noble gases. As with most noble gases, it is chemically inert and does not form bonds with other elements which makes it an ideal medium in preservation efforts because it refuses to react with any other substance. 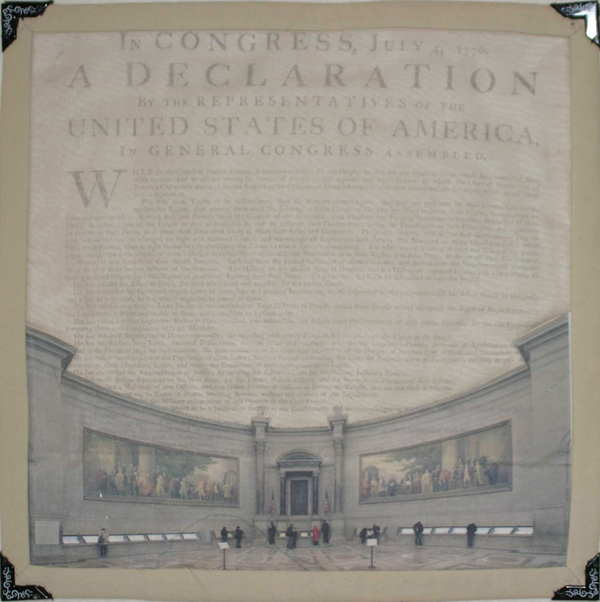 When the National Archives and Records Administration built the Charters of Freedom display for the Declaration of Independence, the Constitution, and the Bill of Rights in the new rotunda at the National Archives Building in Washington DC, it built argon-filled titanium cases to display these pricelss pieces of our history. This entry was posted in Noble Gases, View All Elements and tagged Kim S.